← Feline Fridays Series 6: Literary Cats in the Library! Library Open All Night on December 2-4 and 9-13! 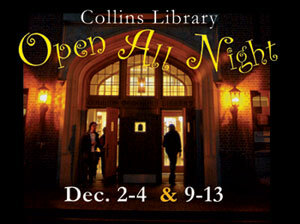 The Collins Library will be open 24/7 – December 2-4 and 9-13, 2012! We wish you the very best on Finals week as the semester ends! Good luck! This entry was posted in Focus on New Services, Uncategorized. Bookmark the permalink.